A confidential survey of residents experiencing homelessness in Central Oregon. WHO should take the survey? I’m not sure I should participate. What do you mean by homeless? WHEN is the PIT Count? Wednesday, January 23rd, 2019. Surveys may be conducted anytime between January 23rd -25th on where people resided on the night of January 23rd, 2019. WHERE will surveys be conducted? Sites throughout Central Oregon including churches, social service organizations, food banks, etc. Volunteers may also seek out sites where unsheltered people reside to survey them, such as camp sites and parks. WHY is there a PIT Count? 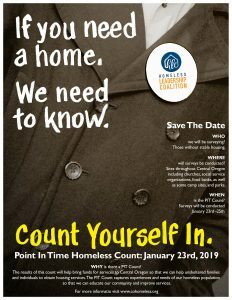 The results of this count will help bring funds for services to Central Oregon so that we can help unsheltered families and individuals to obtain housing services. The PIT Count captures experiences and needs of our homeless population so that we can educate our community and improve services. PIT Counts will be taking place January 23rd, January 24th, and January 25th, depending on location. View dates, locations and times on the Community Calendar! Prineville: 1/17 – 2-4 and 5-7 at the Health Department conference room. In addition to the HUD requirements, Central Oregon also counts people who are at-risk of homelessness and asks additional questions about causes of homelessness, where people were last stably housed, ability to access healthcare, and more. On January 24, 2018, there were at least 787 people who experienced “literal” homelessness (see HUD definition above). The total number of households surveyed increased 12% from 2017. Of the people surveyed, 70% (555 adults and children) identified as unsheltered on this night – meaning they stayed in a place not meant for human habitation on this night. Additional increases from 2017 were seen among unsheltered populations, including unsheltered adults (25%), unsheltered unaccompanied youth ages 18-24 (60%), unsheltered individuals who identified as having a serious mental illness (40%), and unsheltered individuals struggling with substance use (16%). As in previous years, economic reasons, particularly “couldn’t afford rent”, and “unemployment” were cited as the primary cause of people’s homelessness. A full report, released in June, includes results by Jefferson, Deschutes and Crook counties, as well as data on additional subpopulations, household types, access to healthcare, and those who were “doubled up”. Read more about the 2018 Point In Time Count partners and planning efforts here. NOTE: An important note about the data. Because of changes to methodology and definitions of homelessness, it is not advisable to compare between years. If you would like specific information about the HUD reported numbers and cross-year comparisons, please contact us.